What Are the Benefits of Instant Mashed Potatoes? Instant mashed potatoes deliver nutrients, along with the advantage of speedy preparation. Because you make instant mashed potatoes by dehydrating cooked potatoes, instant mashed potatoes retain the same nutrients, but in varying amounts. Prepared dehydrated potatoes are good sources of vitamin C and the B vitamins. They also supply protein and fiber. Just be aware that they're high in carbs that boost your blood sugar. One cup of prepared dehydrated mashed potatoes with butter and milk has 204 calories. You'll get 3.7 grams of protein and 1.7 grams of dietary fiber from a 1-cup serving. These values equal about 7 percent of the daily value for both nutrients, based on consuming 2,000 calories daily. One cup also contains 22.8 grams of total carbohydrates. While carbs provide the benefit of energy, the downside is that potatoes, including the instant varieties, raise your blood sugar. On a scale of zero to 100, instant mashed potatoes have a glycemic index score of 87, which indicates that they spike blood sugar. This can lead to a subsequent drop in energy, fatigue and food cravings. You'll get 20.4 milligrams of vitamin C from 1 cup of prepared instant mashed potatoes. This comes entirely from the potatoes, because milk and butter don't contain vitamin C. This serving delivers 27 percent of women's and 22 percent of men's recommended daily intakes of vitamin C. Vitamin C is well known as an antioxidant that's capable of neutralizing free radicals before these reactive molecules can damage healthy cells. Your body also needs vitamin C to produce collagen, which is a connective tissue that helps build bones and strengthens tendons, skin and other tissues throughout your body. Dehydrated potatoes contain all the B vitamins, except vitamin B-12. You will gain vitamin B-12 if you add milk or butter, however. As a group, the B vitamins help your body metabolize food into energy. Instant mashed potatoes are especially rich sources of thiamin, providing 18 percent of the daily value, based on a 2,000-calorie-a-day diet. Thiamin supports your nervous system and promotes a healthy appetite, according to Colorado University. 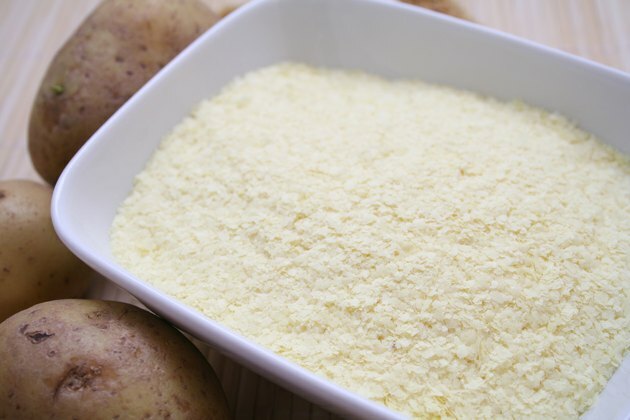 One cup of instant potatoes supplies 10 percent of the daily value of vitamin B-6, which helps produce normal red blood cells, and synthesizes insulin and hemoglobin. Prepared instant mashed potatoes contain 344 milligrams of sodium per cup. Because the Institute of Medicine recommends that you consume no more than 1,500 milligrams of sodium daily, this amount is almost one-fourth of your daily intake. The dehydrated flakes are low in sodium before you prepare them. Milk and butter contribute some sodium, but the instructions also call for extra salt. You can reduce sodium by eliminating the salt or using an herbal salt substitute. The amount of fat is high, because you added whole milk and butter. Reduce the total fat by using fat-free milk, a low-fat butter spread or other flavorings such as low-fat ranch dressing or fat-free sour cream.